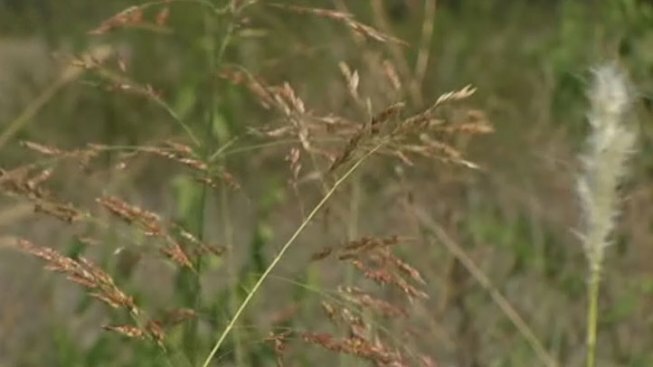 North Texans are running to doctors and pharmacists seeking relief from an early and potentially long allergy season. Ragweed, elm and chenopods are among the more predominant pollen giving North Texans fits according to pollen tracking websites like Pollen.com. Levels for those types are high in Fort Worth, Arlington, Dallas, and other areas. The high levels aren't unexpected -- but the timing is. "I'm not sure if the levels are going to be higher than a typical year, but they certainly came earlier and as long as the weather stays pleasant like this, the ragweed will continue to pollinate," says Dr. James Haden of the Allergy & Asthma Clinic of Fort Worth. "We can expect it to continue to the end of October or early November unless it gets colder," Dr. Haden continued. For allergy sufferers, the tough season means stepping up their therapy. Stephanie Hellstern spent all day Thursday at Haden's office getting Rush Immunotherapy, a series of 16 allergy shots in one day. The treatment should allow Hellstern to not need as many shots in the future and find relief faster. "I've been tired of getting Kleenex and blowing my nose and all that kind of stuff, so I'm hoping for that to stop," says Hellstern, a 29-year old marketing manager. "I don't sneeze just once. I sneeze four or five times in a row. Lots of that and itchy eyes." The best way to avoid allergies -- to stay indoors -- is not very realistic for most of us. But Dr. Haden says we can limit exposure to pollen by driving with car windows up, keeping the windows in homes closed, and wearing wrap-around glasses outside to keep the pollen from getting in our eyes. Haden also suggested that they remove their clothes and shower after doing yard work, so pollen doesn't get all over the house.